So, I just made the decision that once gain, I would go somewhere else, away from home to talk about why the Nextgen plugin is so great, but such annoying .js and how to handle WP when it gets cranky about the <p> tag. I bought my ticket to SF and of course, three days later got the announcement for Wordcamp LA, so yeah!, I get to go to two Wordcamps this year. When I purchased my SF ticket, speakers hadn’t been announced. 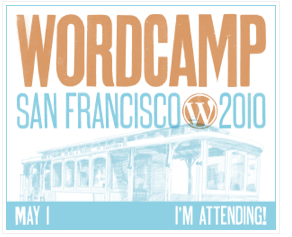 2009 Wordcamp SF list was great, wish I could have been there for that. Just can’t get enough of that Matt Cutts.